The tale of Frozen Charlotte was originally written as poem called “A Corpse Going to a Ball” by Maine journalist Seba Smith in 1843. Smith said he was inspired to write the poem in 1840 when he read a newspaper account of a young woman who froze to death while riding to a New Year’s ball. The story and song were so popular that there were even Frozen Charlotte dolls produced from the 1850s to the 1920s. These dolls were molded as a single piece of china. Sometimes they were baked into Christmas puddings (imagine finding that in your dessert! ), and others were made with a glazed china front and an unglazed stoneware back. 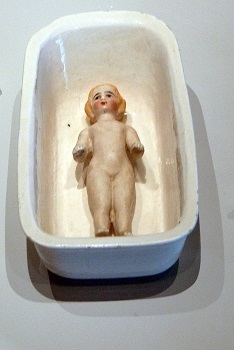 This enabled the doll to float on its back when placed in a bath. Charlotte was the daughter of a wealthy man who lived on a mountainside in Maine. She was well known for her beauty. Her hair was black as a raven’s wings, her skin was white as a lily. Charlotte’s father made certain that she always had whatever dresses were stylish in the city. While Charlotte was the prettiest girl around, she was also the most vain, and self-centered. Everyday she spent hours in front of the mirror, and she loved to make social appearances just so she could be admired by a crowd. One winter, Charlotte received an invitation to a New Year’s Eve ball in a town about sixteen miles from her home. Her father gave her money, and she went to town with her mother and purchased a new dress for the occasion. It was made of silk the color of robin’s eggs, and it fit her perfectly. As the night of the ball drew near, the temperature dropped. A frigid wind kicked up as the sun set. Charlie, Charlotte’s date to the ball arrived in his sleigh, wearing a thick wool cloak, a scarf and fur cap. Eager to leave, Charlotte ran from the house as soon as the sleigh stopped, wearing nothing but her silk dress. Her mother followed her outside and begged Charlotte to bundle up like Charlie. She even offered her finest winter coat for Charlotte to wear, but Charlotte refused, saying that such a bulky coat didn’t go well with her silk dress. Charlie pleaded with Charlotte to take the coat, but Charlotte had made up her mind, and she was a stubborn as she was beautiful. So, they set off into the windy winter night. Several miles into their journey, Charlie asked Charlotte if she was cold. Charlotte was shivering, and said that she was. Charlie told her that he kept a blanket under the seat of his sleigh, and that she was welcome to wrap up in it. Charlotte laughed and said there was no way she was going to arrive at the party smelling like an old horse blanket. They continued on through the frigid night. Soon, Charlie noticed that Charlotte’s lips were as nearly blue as her gown. He stopped the sleigh and offered to give Charlotte his own cloak. She refused, saying that it would only wrinkle her new dress. Charlie sighed, slapped the reins and drove the sleigh onward. Before long, he noticed that Charlotte had grown very still. He glanced at her, and saw that her skin had grown as pale as the moonlight shining through the trees. He pleaded with Charlotte to scoot closer to him so he could put an arm around her and shield her from the wind. But Charlotte shook her head, saying that wasn’t proper for them to sit so close to one another. Then she smiled, and told Charlie that she was starting to feel warmer now. Charlie whipped his horses, driving them as fast as they could run. They came into town and he saw the lights of the village inn. Charlie slowed the sleigh to a stop in front of it. He leapt from the sleigh and extended his hand to Charlotte, telling her that they would rest here, she could warm herself by the fire inside. But Charlotte made no reply, she didn’t even move. Horrified, Charlie took Charlotte’s hand in his own, and found that she had frozen as solid as marble statute!